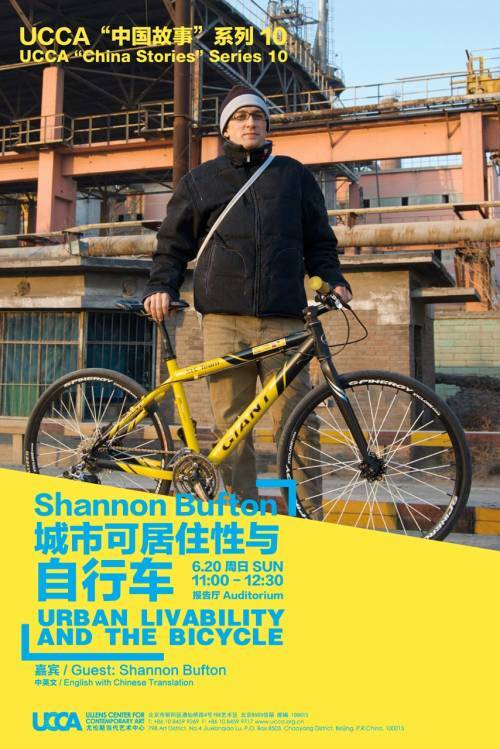 This weekend I will be giving a lecture at the UCCA in 798 about Urban Liveability and the bicycle. As many of you may know I come from an architecture / urban design background and over the past 6 months I have been giving a lot of thought to this city and its bicycle culture. 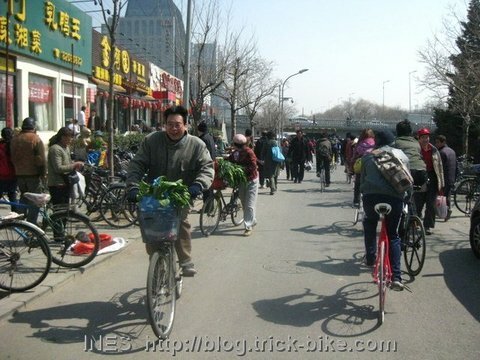 As we all know Beijing was once the ultimate bicycle city with around 80% of its residents using the bicycle to move around. 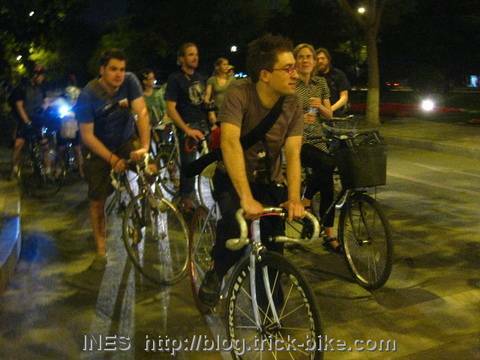 These days ridership is down to 20% as cyclists ditch the bike in favor of the car. Thousands of new cars are hitting the streets in Beijing every week and are turning Beijing into the new ‚car kingdom‘. At the same time Beijing is getting serious about becoming a World City and improving the liveability of the capital for its residents. The trend in the most liveable cities in the world is shifting away from a focus on the automobile for urban mobility in city centers and towards more sustainable and people friendly forms of transportation such as the bicycle. 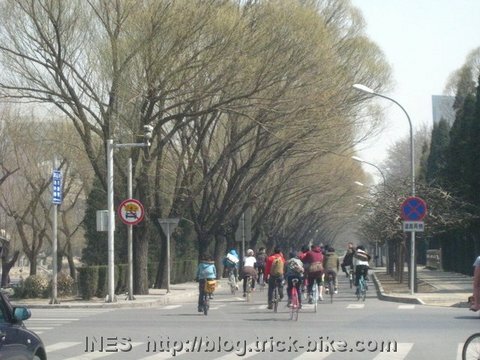 Beijing is now at the cross roads with its bicycle culture in decline- it can let wither and die or it can start to promote Bicycling 2.0 in the city and assist in a more rapid transition to a World class liveable city. Language : English / Chinese. The Tianjin TV documentary about my thoughts to a greener Beijing and blue sky that was broadcasted last year is now online. 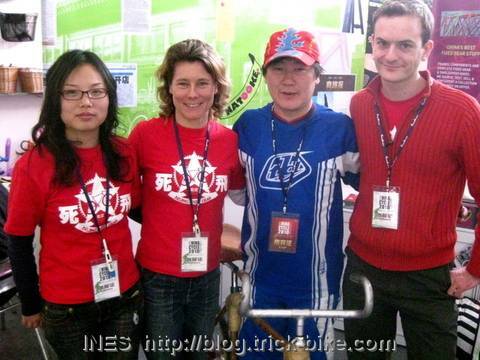 You can watch the full 30 minute film at this link: 单车天使 Fairy on the Wheels – Ines Brunn 伊泉. 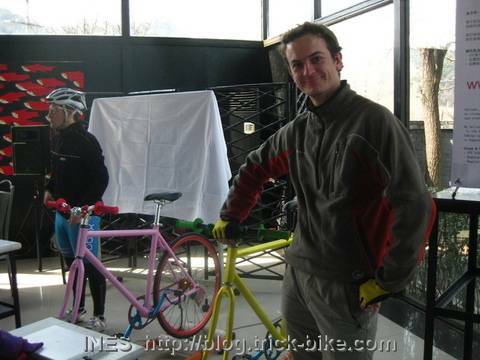 It shows my participation in the 2008 Greening the Beige event with my bicycle performance, how I cycle everywhere in all kinds of clothes, and how we started the Beijing fixed gear group. 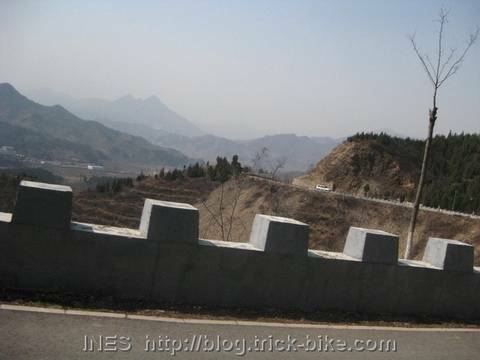 As well as my efforts to promote cycling for a better environment and blue Beijing sky. Unrelated but interesting: Bobby Spokes made a comment on a South China Morning Post newspaper letter claiming that bikes are in the way of Porsche and Ferrari drivers in Hong Kong. He wrote: „You can throw a bit of science in. 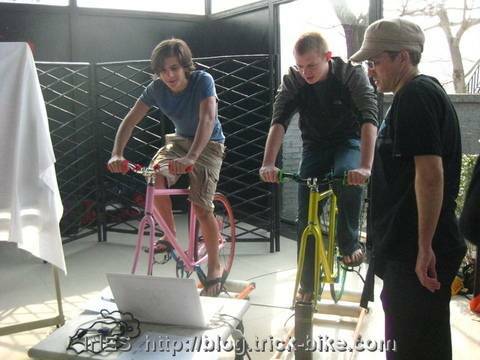 Cycling can take a quarter off a person’s perceived age and a third off the emotional and metabolic age. …“. I did not know that. And I could not find any scientific evidence yet. But that is probably why everybody thinks I am so young. 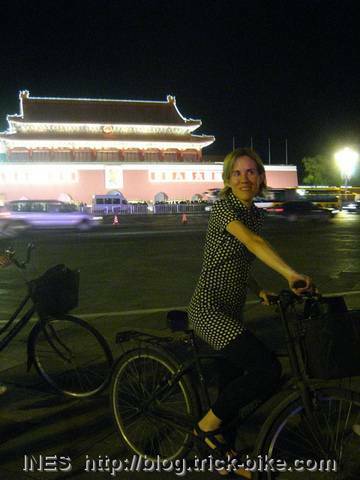 You should cycle more too 🙂 I also found an article in China daily about cycling in Beijing. 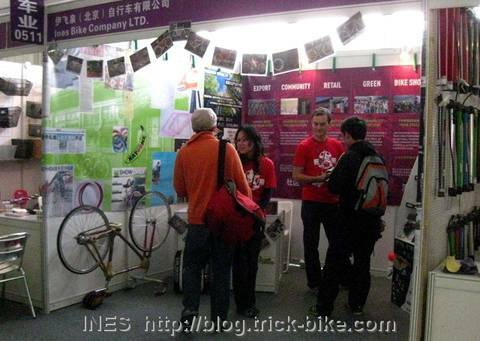 I am having the impression that there are less walk in visitors at this year’s China Cycle exhibition. 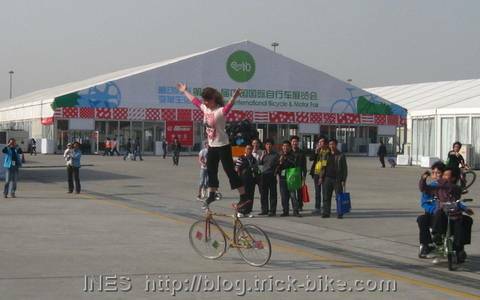 But it is still fun to perform on the open area and watch how my bicycle stunts draw a crowd. 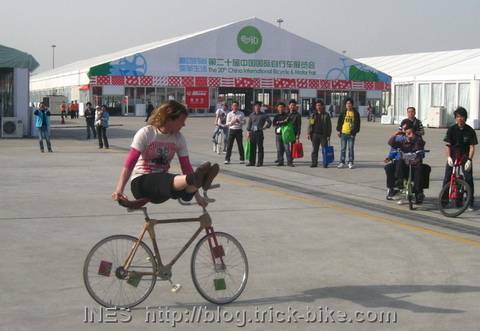 Here are some pictures of me (Ines Brunn) doing bike tricks on a bamboo bike made by Stalk. There are new buildings around the exhibition center that have not been there last year. Like this one that looks like it has caves for rock climbing. It really looks inviting. 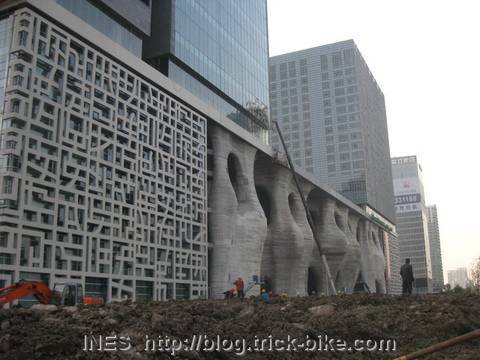 I wonder if anybody will try to climb it when it is finished. 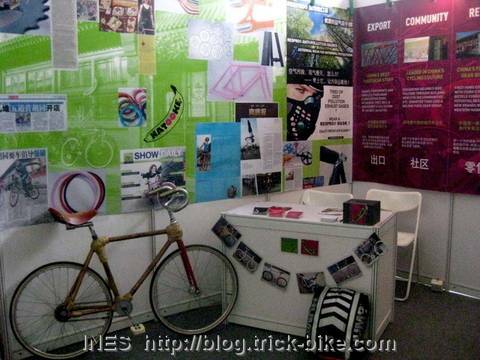 In the innovation center of the China Cycle exhibition in Shanghai they had some interesting bicycle designs. My favorite was this really nicely done wooden bike in the form of a 60 for the 60th year anniversary of the People’s Republic of China. There was a conference on „Low Carbon Emission“ so Shannon and I (who co-founded STC) went to listen to their ideas. 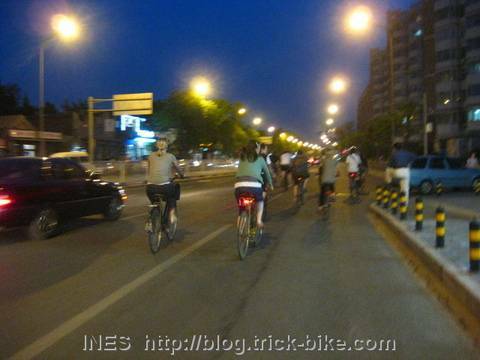 It was actually about a bike ride from Beijing to Shenzhen called „China Tour“ to promote cycling as „Low Carbon Life“. 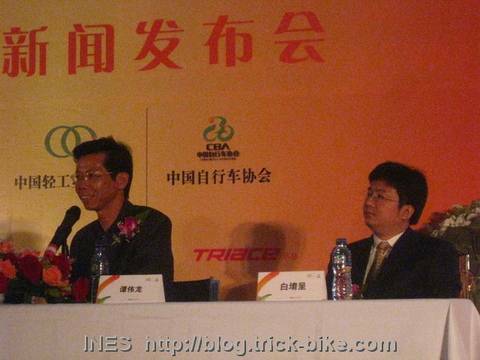 It is organized by the China Bicycle Association (CBA) together with the company Xidesheng (XDS). 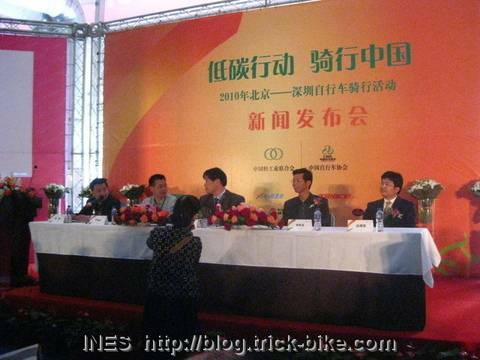 The launching event on May 16th in Beijing Chaoyang Park will be organized by a PR company. 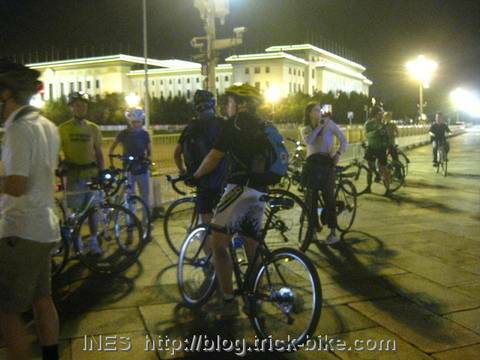 Then a few young cyclists did a circle in the venue with the China Tour outfit. 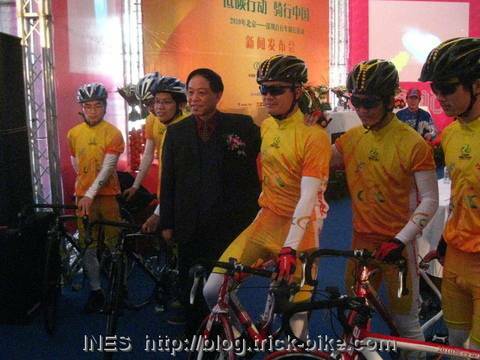 The 12 cyclists that will ride from Beijing through China down to Shenzhen have already been selected. But Shannon and I are looking for a way to participate with STC. 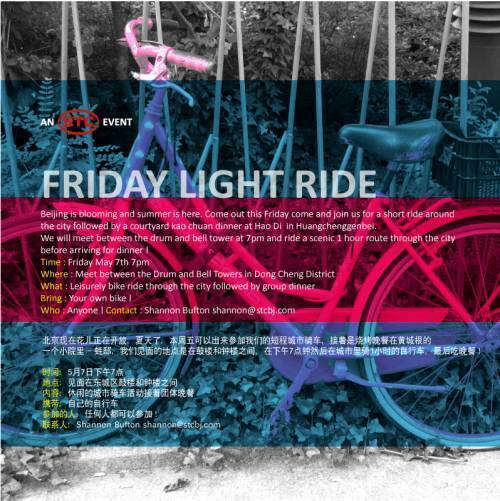 There was bicycle art by Fang Zu Han. 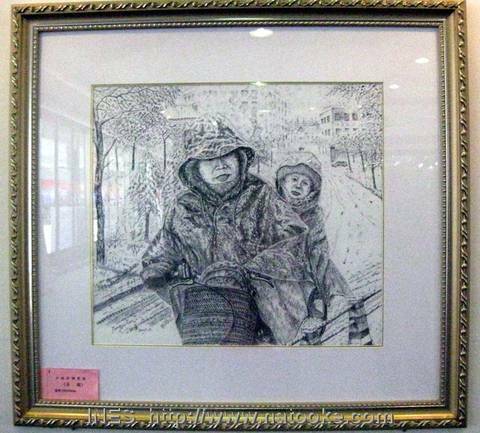 He does nice pencil drawings. I prefer this one. 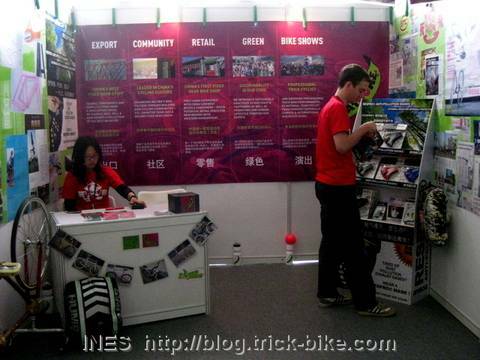 First day of the 2010 China Cycle Exhibition. I was astonished to see so many exhibitors getting in early in the morning. We actually had to wait a while in the crowd until we finally got in. Our booth was different than most booths. We wanted the people to interact with us. 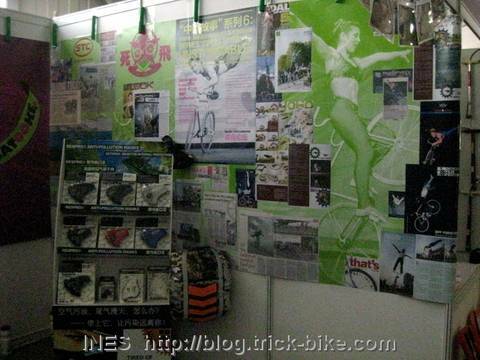 So we had the walls covered with some of the many newspaper and magazine articles about my Natooke store, the Respro anti-pollution masks and hump backpack covers, the Beijing fixed gear bicycle group, the STC cycling initiative and my trick bike performances. 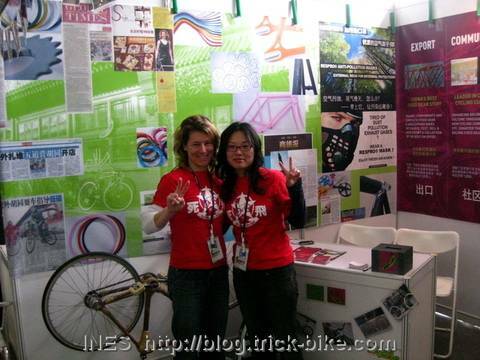 We would have liked to display more bikes but it would have been hard to transport them to Shanghai by train. 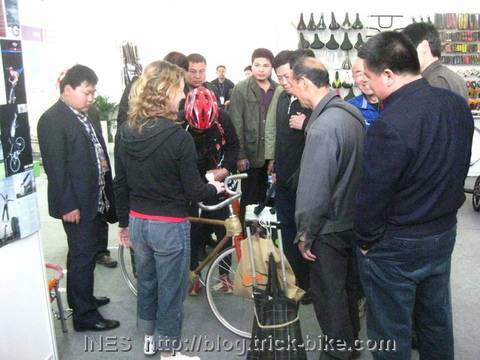 So we decided only to take the bamboo bike made by my friend Zack Jiang. Bamboo is a green alternative to metal. 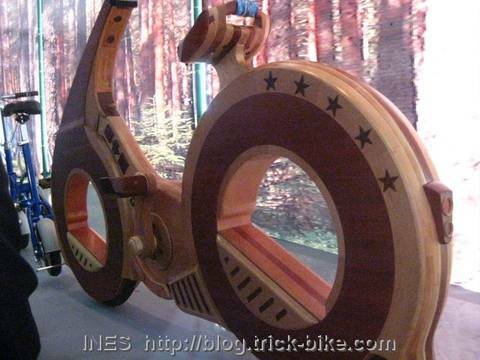 This bamboo bike is made in the same geometry as my trick bike. Zack made it to prove that his bamboo bikes are really stable and do not brake even if I do my extreme bicycle tricks on this bamboo bike. The bike got quite some attention at the booth. 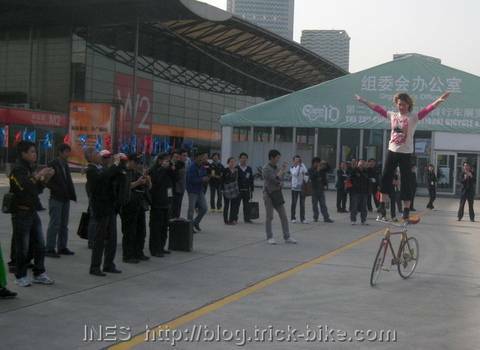 Of course I also met friends like Zhou Chang Chun who does some Chinese style bike tricks. 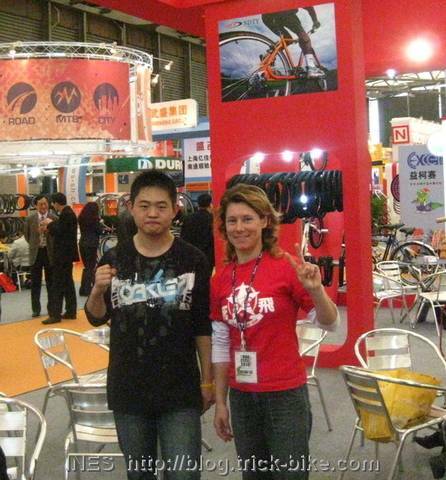 As well as a cyclist friend from Tianjin called Baihua working in a newly started outer tire company that tries to look like CST brand. 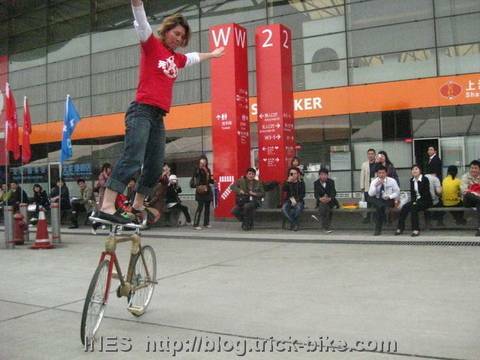 I performed bicycle tricks 2 times today on the bamboo bike. I made a webalbum with more pictures. But here are just a few. It was nice how easy it was to draw a crowd. And also people video taping that all said they have never seen anything like this. Right after each show I got swamped with people. It was really fun. 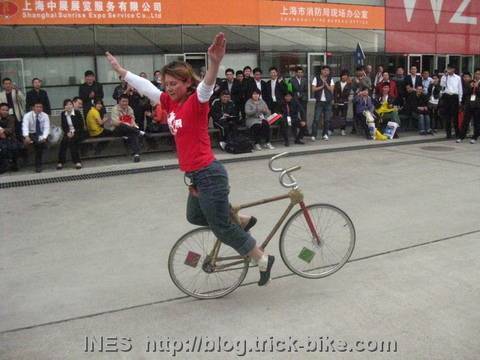 A lot were not believing that it was a real bamboo bike. I met some great people that know me through the bicycle film festival, like Karta Healy. 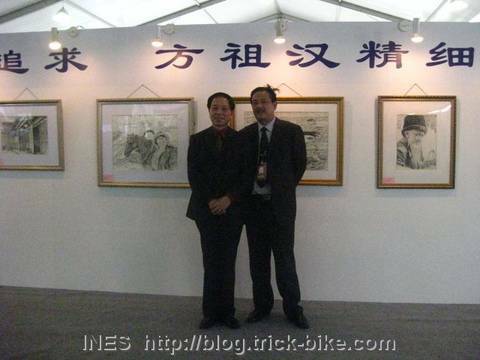 Also of course some Beijing friends like Master Yang had also travelled to Shanghai for this exhibition which is the biggest cycling show in China. 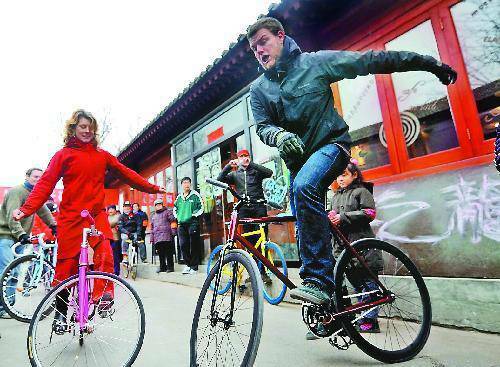 The Schoolhouse at Mutianyu organization and the China Charity Challenge co-hosted a charity bike event at their Roadhouse near the Great Wall North of Beijing. 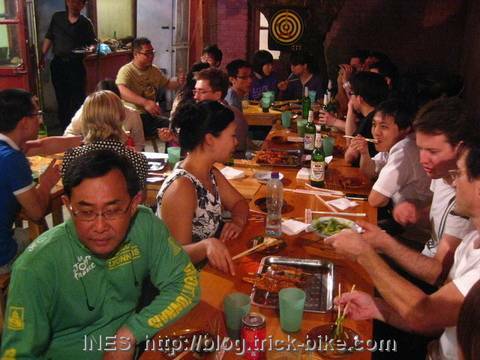 The event was called „Bohai or Bust„. All of the 100.-RMB registration fee is going to charity to provide a dinner, program and gift packages for the community’s elderly residents of the villages around Bohai and Mutianyu. 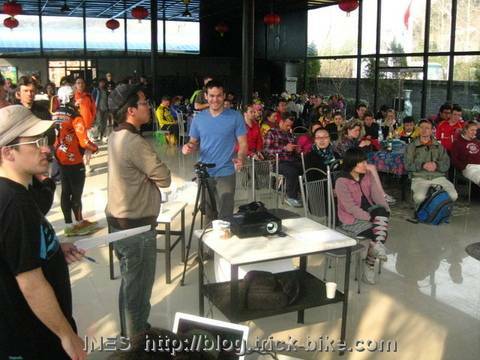 Almost 200 hundred people signed up and over half of them came to the meeting point at the TREK shop near Chaoyang Park. The bikes were loaded into 3 trucks and there were 2 huge buses. 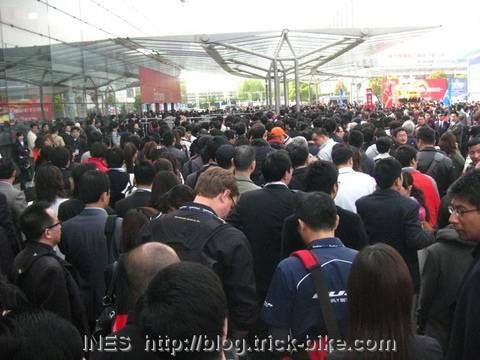 Unfortunately we encountered some holiday traffic as most companies in China have the coming Monday off. In the name of STC Shannon and I had prepared the JisuPK. JisuPK is very fun bicycle event where 2 competitors on bikes attached to stationary rollers race each other in front of a cheering crowd. Typically a race lasts only 30 seconds and the winner is the rider that covers the set distance the quickest. The progress of the race is projected onto a screen so the crowd can get behind their favorite rider. Participants can challenge a friend to a race, race a colleague, race someone from another country, even race their Mum! This picture I took at the top of Sihai mountain. 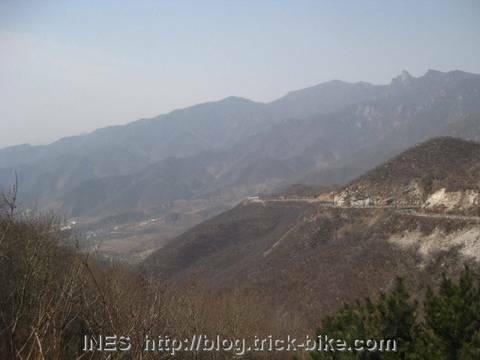 That is a very great mountain to ride a road bike up. Samantha Song came out with us. 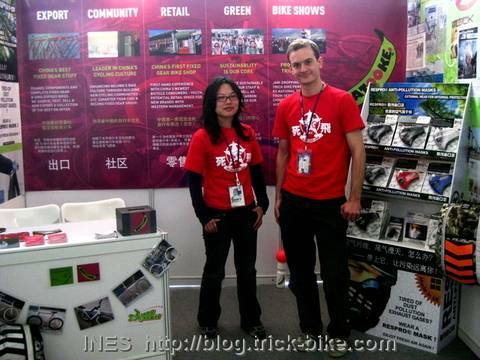 She did not ride bike but stayed at our Natooke shop booth, even though there were not many people until 1pm. When I arrived back there was a dance exhibition put on by a local troupe of villagers. There was a barbeque going on. Then we started the JisuPK. 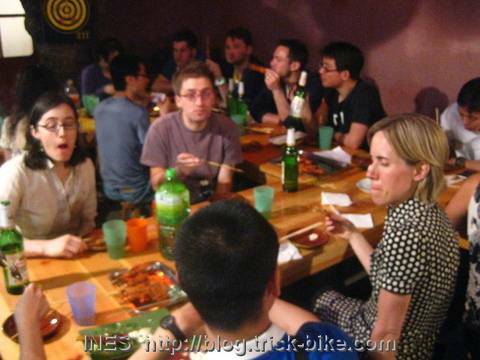 It seems the bike riding in the fresh air and beautiful mountains plus the food made most people very lazy. But we did get some guys to race. 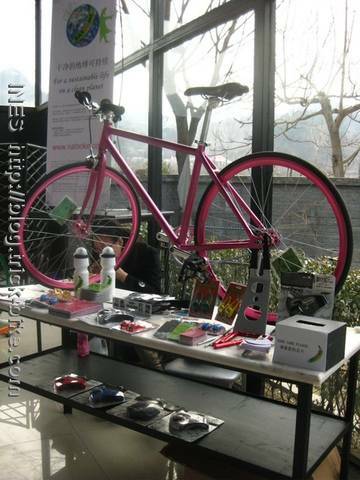 My friend Anthony is planning a bike ride through South China. He has a website called ride2freedom.org and did a post about this event today. The buses and trucks actually left for Beijing on time at 4:30. And the traffic back into the city was less bad as expected. The motto of this „Smarter Than Car“ (STC) bike ride today was: We are taking the audacious step of announcing that spring is here! Despite the sandstorms and late snow the temperature is rising quickly and the weekend is forecast to hit 18 degrees. About time! 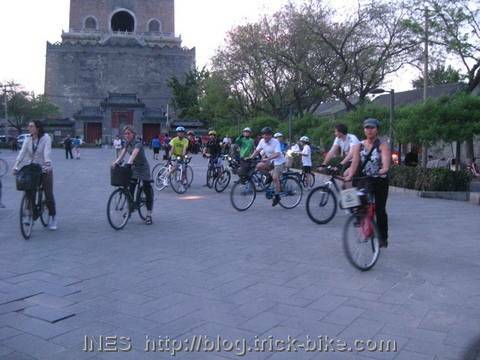 So dust off your bike and get ready for a leisurely Sunday morning ride through the city. 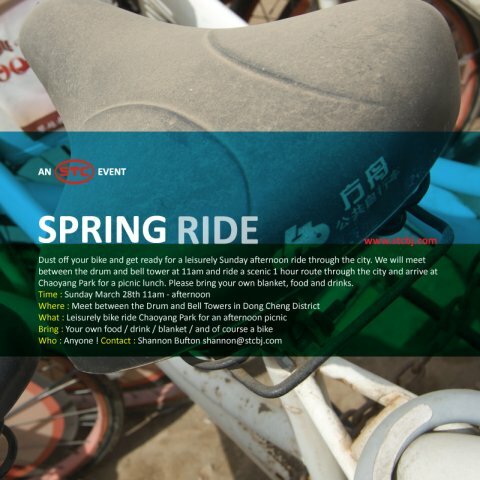 We will meet between the drum and bell tower at 11am and ride a scenic 1 hour route through the city and arrive at Chaoyang Park for a picnic lunch. Please bring your own blanket, food and drinks. 春天骑行: 我们斗胆宣布一下春天到了. 抛开沙尘暴和春雪不说, 气温正快速回升,预计周末能达到18度. 好不容易熬出来了. 所以把你的自行车擦干净, 准备好周日下午的快乐骑行吧. 我们上午11点在鼓楼和钟楼中间的空地集合, 然后骑1个小时, 享受城中美景, 最后到达朝阳公园野餐. 请带上毯子,吃的喝的. 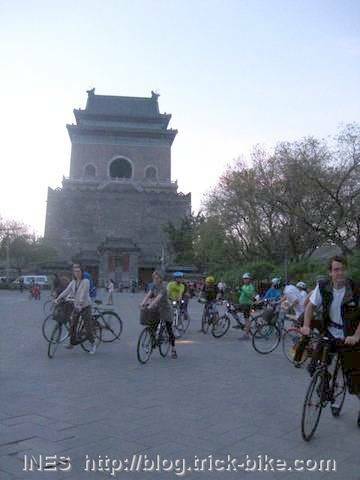 It was nice to see my fixed gear bike friends come meet us at the Beijing drum and bell tower. That was particularly good as we had a woman and a camera man from Beijing TV station come to take footage of the event. 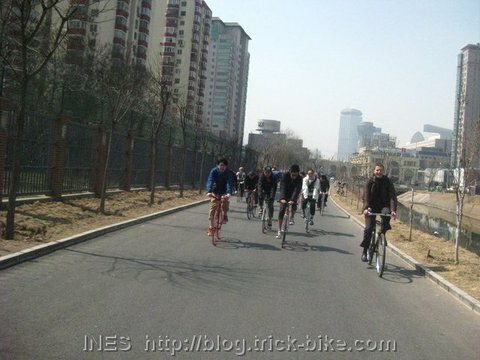 I thought they would film this spring bike ride which has the idea to encourage people to ride their bikes in Beijing as a low carbon emission and fun transportation method. 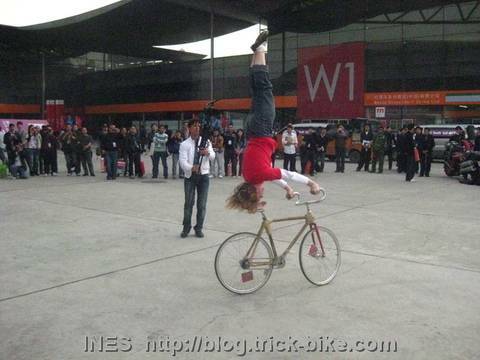 But no, Beijing TV was more interested in me doing a trick bike performance. I had come to this ride with my cyclo cross bike and outdoor shoes as after the ride I was heading to the TREK cyclo cross race. 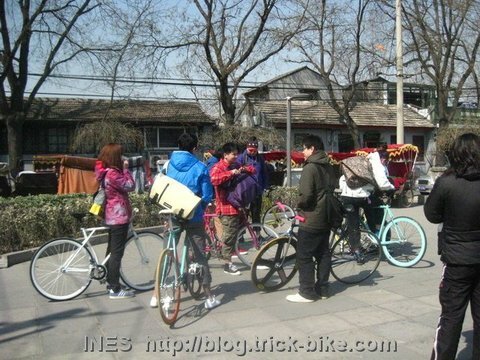 As I did not bring any one of my fixed gear bikes I said that they should film someone else of the Beijing fixed gear group. So we first asked Liang Xing aka Ryo to do some skidding on his fixie. That was okay until he skid into a barrier. But he bent it back and it actually still worked afterwards so the guards were not too upset. 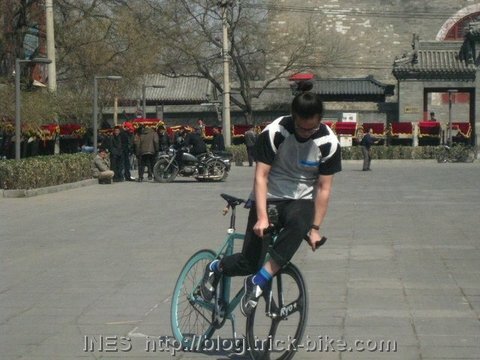 Well then I grabbed a 56cm Natooke fixed gear bike (which was way too tall for me) off one of the guys and did some tricks for Beijing TV. 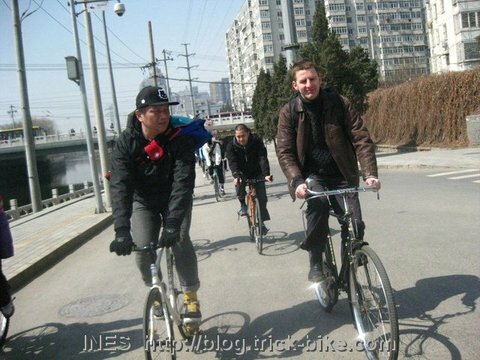 And after some more photos for Global Times we could finally set out for our STC spring bike ride. In the beginning of the ride there were a lot of people on the streets in this beautiful weather. As we cycles along the side of one of Beijing’s canals we came past a group of people watching 3 people pulling a guy that probably could not swim out of the canal. I have no idea how he could have fallen in the canal, maybe he was already drunk. But it was good to see that he was still alive. I love this route along the canal, you have almost the whole road for cyclists. Once in a while there is a car but it is amazing how empty it is despite in being in the center of the city. More of my pictures are in this webalbum of our Smarter Than Car ride. 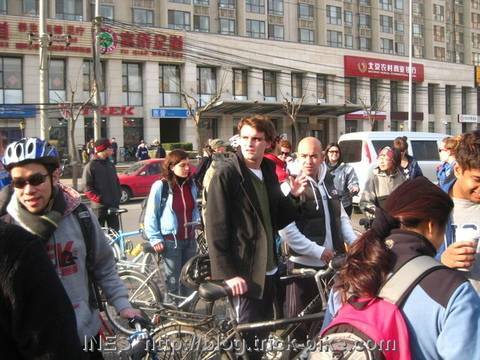 The group arrived at the Chaoyang Park. But as we could not bring our bicycles inside (only kids are allowed to do that and we were considered too old) the majority of thd fixed gear guys headed off. I unfortunately had to go to board the bus to head out for the cyclo cross race. And the others locked their bikes and went inside the park for a spring picnic. Shannon Bufton and I are looking forward to more people joining us for the next STC bike rides. Today there were more articles about our Natooke opening party yesterday. The one in the Global Times was written very nice. Here is the link to the original version. 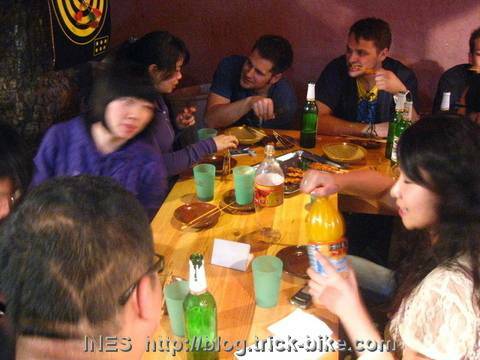 An impromptu street party broke out in Wudaoying Hutong over the weekend to mark the official opening party of Natooke. 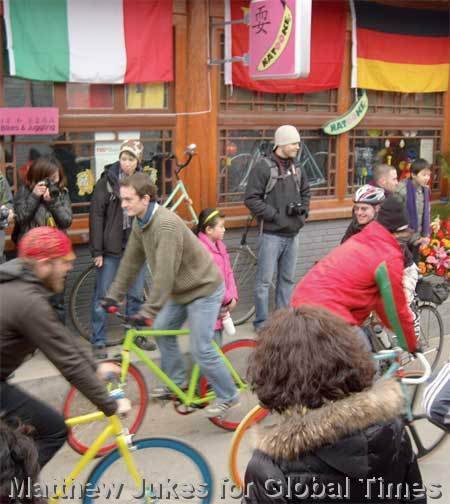 The shop has been in place for a while, as a hub for the fixed gear bike and juggling groups that it caters to, but on Sunday the owners decided to celebrate the arrival of their business license in style. „We thought we’d have the party in spring because it would be warm. It’s going to snow tonight!“ said CEO Ines Brunn. „We hope that there will be more people that get on their bikes in the city and come ride with us. Oh and that more people start juggling!“ she added, before disappearing into the throng. By early afternoon a juggling workshop was well under way, thanks to the shop’s director, and Beijing juggler Federico Moro, surrounded by a ring of eager learners of all ages. „It has been great, everyone is really happy. We’re setting up as a good business in this neighborhood, no one else is doing something like this on this street,“ said Moro, after his workshop. According to the juggler, this shop is the first of its kind to sell juggling equipment to the individual practitioner, a concept that hasn’t taken off in China yet. „Juggling is spreading all over the world. In China I want to be here for that and help it to develop,“ he added. 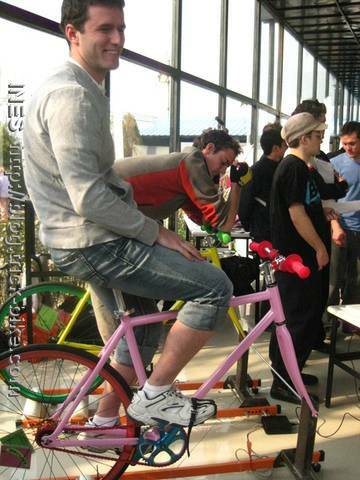 As the learners made their way into the shop to get out of the cold with a few balloon animals, cheers rose up from the crowd as another pair of participants got on to the Goldsprint machine (a kind of bike simulator) to test their biking potential from the comfort of the shop. As always with an outdoorsy crowd, there was a bit of a green message. The shop was passing out reusable plastic bottles for the crowd and a slogan on a red banner urged everyone to respect the environment. 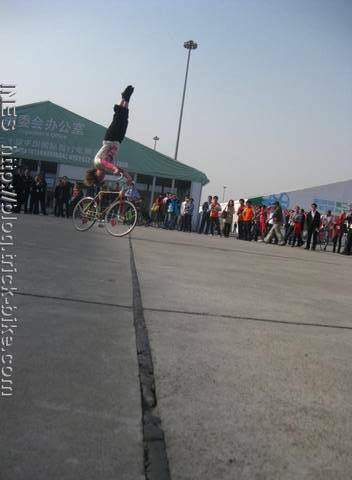 As the day progressed, the shows grew steadily more and more spectacular, impressing the crowd with a trick bike display and street performance routine. Passersby and friends of the shop alike were also equally happy to take part in toasting to congratulate the shop as champagne was passed round and party poppers were let off. Judging by the remaining crowd at the end of the day, the little alternative hub in Wudaoying looks set for success for the coming times. 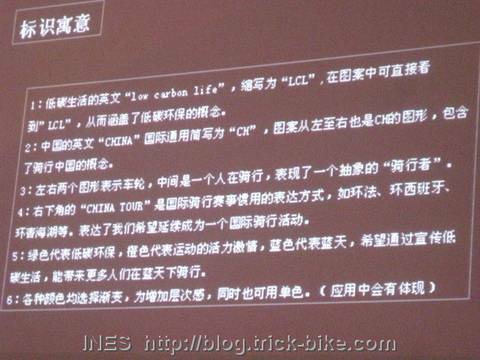 There are also some more articles written in Chinese on various websites across China.